The March of the Penguins is an incredible movie. After watching it, I am amazed at how well a species can adapt to harsh conditions. 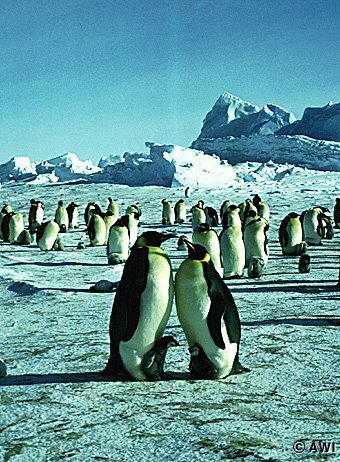 Penguins walk for miles to their mating ground, pick a mate, and fertilize an egg. The male then holds the egg for months between its legs, without food, as the female goes to feed. When the baby is hatched, the male will provide it with one regurgitated meal and wait for the female to return. When she does, she will continue to feed the chick regurgitated fish for months out of her belly until it is old enough to go on its own. In this manner, the penguins survive in winters up to -80 degrees without shelter and go months without eating. 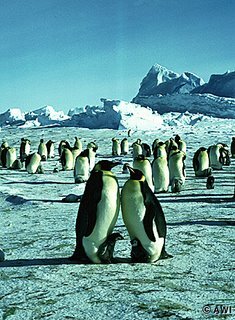 It is an amazing testament to the survival of one of the only land animals that continue to inhabit Antarctica. It is their collectivistic nature as a species that has saved them from the icy cold all these years. They hike en masse for 70 km and huddle together to keep from freezing. Of all the species that existed in Antarctica before, from when it was a tropical place, only the resilient penguin was resourceful enough to survive. Will this be the same for humans once global warming (or nuclear war) hits us full-force? Will we be whittled down to a select minority of the lucky, hardy or adequately mutated? Or must we adapt equally elaborate and sensitive rituals to survive as well?